An ounce of prevention is worth a pound of cure—especially when it comes to protecting your expensive electronic devices from power surges. Without a surge protector, a sudden spike of electricity could fry your television (not to mention your computer, your gaming console, or even your Amazon Alexa). You can safeguard your electronic devices against such damages by plugging them into a good surge protector. There are a lot of options for surge protectors out there, so we’ve done the research to help you find the right one for you. Below, you’ll find only the best-rated surge protectors to use in your home. Among our favorites you’ll find power strips for localized protection, portable outlets for on-the-go use, and even options for whole-house protection. Keep reading to see what makes our top picks stand out—and what you should know before you buy. In choosing the best surge protectors, we looked for units with good safety ratings, flexible usage options, excellent customer reviews, and useful extra features. These five stood out from the rest. All five of our favorite surge protectors offer good protection at a reasonable cost, but their different features mean that one might work better for you than the others. To help you make an informed decision, we’ve broken down the pros and cons of each and described what makes it stand out from the pack. The Tripp Lite 10 Outlet doesn’t have the best outlet layout or the highest energy rating—though both are still very good. But it does offer a unique feature that puts it at the top of our list: when this surge protector can no longer offer adequate protection after an overload, it automatically shuts off power to connected devices. Doing so helps keep your devices safe if there’s another surge. This added safety measure, particularly when combined with its good design, makes the Tripp Lite 10 Outlet our favorite surge protector. This Belkin surge protector offers the most versatile outlet layout and the highest energy rating of our picks. As the name suggests, the Belkin Pivot Plug has plugs that change angle by swiveling. This makes it easy to plug in all your devices—including those with bulky power blocks or transformers. With 12 outlets, you should have no problem protecting your entire entertainment center. Unlike our top pick, the Belkin Pivot Plug doesn’t have automatic shutoff, which keeps it in second place. If that feature doesn’t matter to you, the Belkin Pivot Plug offers a smart design and good protection, making it a great choice. If you want to save power while protecting your devices, consider the APC 11-Outlet surge protector. Its unique design features a “master outlet” that controls seven of the remaining outlets. 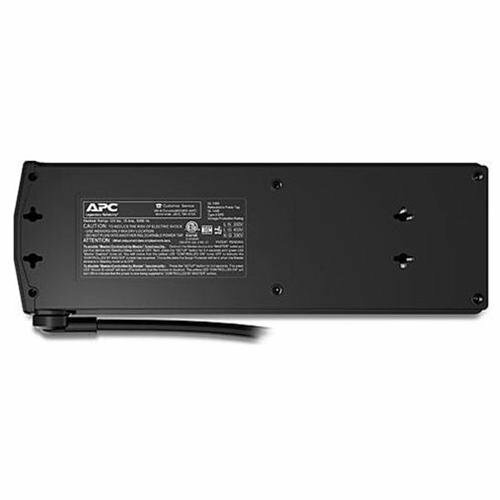 When you turn off the device in the master outlet, the APC 11-Outlet cuts power to those seven outlets. For example, if you plug your TV into the master outlet and your speakers, Blu-ray player, and gaming console into the controlled outlets, your periphery devices will get power only if the TV is on. We love the APC’s energy-saving abilities and its well-spaced outlets (though the design lacks the cleverness of our Belkin pick above). Some customers report difficulty plugging things into the outlets, and we wish it had the automatic shutoff of our top pick. 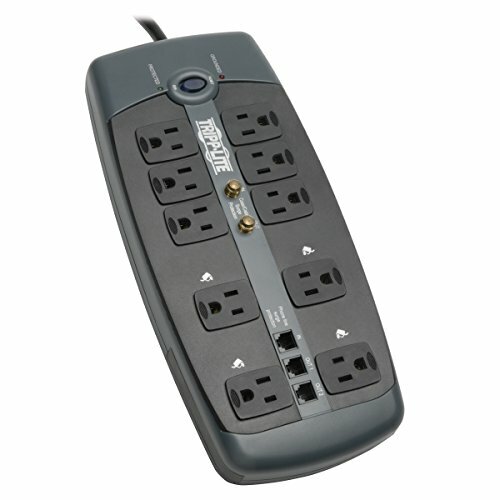 Still, if you care about saving energy, the APC 11-Outlet Surge Protector offers the easiest way to do so. Unlike our other picks, the Eaton CHSPT2ULTRA protects your whole house after you wire the surge protector into your breaker. You won’t have to worry about plugging every single device into a power strip surge protector, as everything from your TV to your lamps to your washer and dryer will be protected—although doubling up with a power strip surge protector is a good idea for delicate devices. Because it’s installed at your breaker, the Eaton remains out of sight, which you might prefer to a bulky, ugly power strip–style surge protector. The Eaton CHSPT2ULTRA costs the most of our picks, usually around $100, but whole-house protection justifies the price. 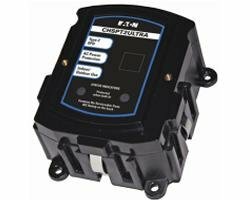 Keep in mind that the Eaton CHSPT2ULTRA must be hardwired, so you may also need to pay for installation. While you can do it yourself, we recommend you hire an electrician to install it for you. This will not only keep you safe but also keep your warranty intact. The Tripp Lite Direct Plug-in has just one outlet, making it a perfect choice to use while traveling or whenever you need to plug in just one device. Don’t be deceived by this surge protector’s small size and affordability—it still offers adequate protection for your devices. Of course, if you’re trying to protect all your entertainment devices or your computer and its peripheries, you’ll probably want more than one outlet, in which case this might not be the surge protector for you. 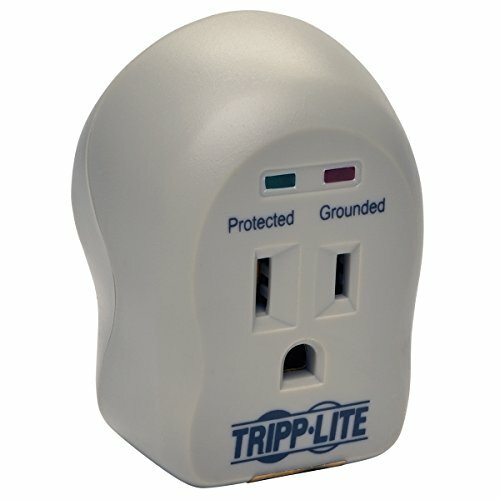 But if you want to safely plug in your laptop in hotel rooms or other locations, the Tripp Lite Direct Plug-in provides affordable and highly mobile protection. As smart homes become more and more common, it’s no surprise that “smart” surge protectors have entered the market. These surge protectors are meant to work with your home automation system or your security system, offering you more control over your devices. Unfortunately, the technology just isn’t there yet. 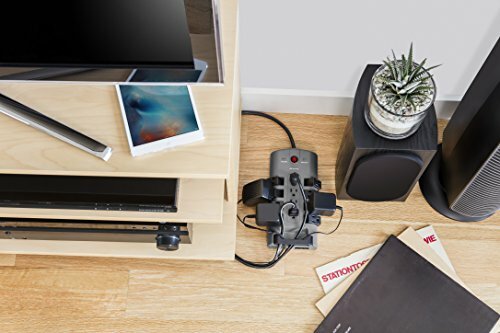 Smart surge protectors universally receive poor reviews, with customers complaining about connection problems and glitchy apps. We expect quality to improve as more companies develop smart surge protectors. Until then, consider using smart plugs with a whole-house surge protector like the Eaton CHSPT2ULTRA, or simply plug your smart devices into a power strip surge protector. Ready to start protecting your electronic devices? Here’s some more information that can help you decide which of our best-rated surge protectors is right for your home. As you’ve probably heard, sudden bursts of power can fry your electronic devices. A surge protector keeps this from happening. Put simply, a surge protector keeps a power surge from entering your devices, instead diverting the energy spike into itself. This is why surge protectors are often called “sacrificial.” They take the hit so your devices don’t have to. Despite what you may have been told, even the best surge protector can’t save your devices from a direct lightning strike. If you’re concerned about lightning, simply unplug your devices during a storm. It may sound rudimentary, but unplugging will protect your devices from lightning far better than a surge protector ever could. Fortunately, a surge protector can protect against other, more common surge sources. Often, a power surge comes from within your own home—it can even be caused by your own devices. Other times, it comes from the external electrical grid. While these sources might not sound as memorable as a lightning strike, they can definitely destroy your devices. Many surge protectors take the form of a power strip—a long unit with several outlets. However, not all power strips are surge protectors. Most power strips give you access to more outlets and maybe an on/off switch, but they don’t provide any meaningful protection from energy spikes. Though they may look similar, a surge protector will help keep your devices safe, but a plain power strip won’t. 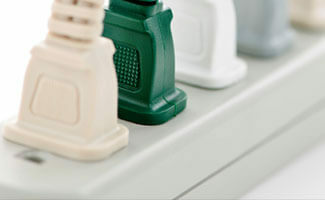 Power strip surge protectors are the most common. They’re affordable, they provide extra outlets, and they’re easy to use—just plug them into a wall and plug your devices in. They’re a good choice for most homes, especially if the devices you want to protect are close together. Direct plug-in surge protectors function just like power strip surge protectors, except they don’t have a cord and usually have just one or two outlets. They’re best for on-the-go use, but they can also be useful if you need to protect only one device or if you don’t want the bulk of a power strip. Whole-house surge protectors are wired directly into your home, usually at your breaker. This lets them protect your entire house, including items you don’t or can’t use with power strip surge protectors. Whole-house surge protectors are pricier than power strips or plug-ins, and you should have them professionally installed for safety and warranty reasons. For maximum protection, you can double up by using a whole-house surge protector plus power strip or plug-in surge protectors. This method lets you protect all your devices while providing extra protection to any delicate or sensitive devices. Use your surge protector properly to keep your home safe. Don’t plug a surge protector into another surge protector, or even a non-protecting power strip into a surge protector power strip. Chaining surge protectors can pose a fire hazard. Likewise, an old or damaged surge protector can be a fire risk, so replace your unit as needed. Remember, surge protectors don’t last forever. A surge protector keeps your equipment safe by taking the brunt of a power spike, sacrificing its own integrity to preserve your devices. Your surge protector might survive a few surges, but it will eventually stop protecting. That’s why all our favorite surge protectors have an LED indicator to tell you whether or not your surge protector is still working. Pay attention to that light and replace your surge protector when necessary. You might not like replacing your surge protector, but it’s much cheaper than replacing all your connected devices. 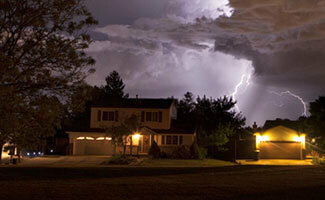 You can’t predict when your home will be hit by an energy surge, but you can guard against it. Each of our five favorite surge protectors provides an excellent way to preemptively protect your important electronics. Whether you choose a whole-house protector or a power strip, a little prevention today can go a long way tomorrow.